Describe my journey as I seek to "BEAT Diabetes" by achieving proper health and fitness levels. I will be using a Low Carb / Primal Diet. Along the way I hope to entertain, educate and motivate. Steve Update for ….wait, what day is this? Just when you thought that Steve had reached the lowest of lows…he did it again. Why? My latest weight is 157.5 …from my highest of 235 lbs… I’ve lost 77.5 LBS!!! Question: It’s only a pound from a couple of weeks ago….what’s the big deal? Answer: My NEW goal was to not lose additional weight!!! I am eating all I want of good, healthy, tasty and nutritious foods….AND I STILL LOSE WEIGHT!!! · you exercise 30-60 mins, 5-6 days a week. · Eat meats, veggies, fruits, nuts >>> Limiting processed foods. I am more fit and I am getting stronger every SINGLE week. 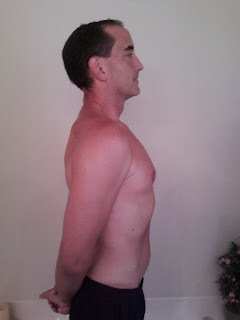 … every week I see an increase of strength in some area of fitness…. I DO NOT want to lose any more weight… I do NOT…but if I continue to gain in strength every week….I am NOT worried about it. BTW - having "6 pack abs" is a function of body fat...the lower your body fat % the more they will show. Question: Ok, Steve, we get it. You are losing weight, you are getting stonger…but what about your heart and blood, what has been the affect from your diet and exercising? Did you see my blood work results? Below is the link to the previous post. Results from my doctor visit/blood work. Weight: 165 lbs (clothed with cell phone, wallet etc) --- LOST 70 lbs! So… 7 months from being an obese, sedentary garbage disposal…. I am rated highest in every category except for LDL where I am “near optimum”. I loved hearing that….and I really love sharing it. IF YOU SUFFER from being overweight or diabetes…. PLEASE do something about it. 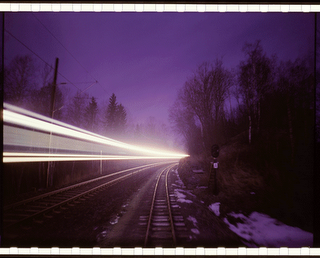 It is a journey you WILL want to take….like all journey’s they all have a “first step”. Your “first step” can be contacting me for assistance. BG (Blood Glucose) Update – This morning…. I read an “89”…so yes…I am sporting a NORMAL Blood Sugar reading….normal for NON-DIABETICS that is. It has been a month since my last post… this is going to be a long one... much to tell. I've been busy and working on some projects, it was just difficult for me to find the time. I’ve been updating folks in Facebook … it is sooo much easier to post items there…if you want to stay updated in the future it would be best for you to find me at this link http://profile.to/stevecooksey/ on Facebook. Last week I received the results of my blood lab work. Before I made the results public, I wanted to obtain the same information from my blood reports while I was in the hospital in Feb. ’09, about 7 months earlier. Why? You know…so I would have something to compare it to. Despite the fact that for 3 days I was a human pin cushion AND despite the high priced cost of the 3 day hospital stay….apparently the information was not recorded. The only note that was made on the reports was “cholesterol high”. Let’s see….hmmm….I was obese, just diagnosed diabetic with high blood pressure… to me, writing “cholesterol high” really didn’t add any new information to the equation… I think “cholesterol high” given the circumstances…was a given. I was nervous and anxious heading into the visit... I had been off all meds and insulin for about 6 months...and I have drastically changed my LIFESTYLE. I had changed from a slothful, sedentary garbage disposal to an exercising, nutritious eating…person. IMPORTANT – PLEASE read and pass this info on to known diabetics…please! When I discharged from the hospital I stumbled about for a couple of weeks on the ADA/FDA Food Pyramid ( giving this to diabetics should be criminal, it is immoral and unethical ). My doctor referred me to the Low Glycemic Diet, in a nutshell, the diet suggests swapping higher carb foods for lower carb foods. I adhered to this diet for several weeks and saw good results as my blood sugars came down. BUT I thought…if swapping for lower was “good” …wouldn’t swapping for even lower carbs be better? …. The answer was…YES!!! After about a month I was completely weaned off of insulin and all medications. So I thought…I was doing AWESOME!!!! WHY did I think I was doing awesome?….because everything given to me by the “medical community” said that normal fasting overnight blood sugar range is 70 – 120 and I was consistently in the 100-115 range… so I was “NORMAL” ….right? For months I was doing “my thing”, I was eating lean meats, veggies, nuts, beans, whole grain cereal, occasional whole grain pasta and occasional rice etc etc. Life was good. I check my blood sugar every couple of weeks, I was always in the 100-115 range. Normal Fasting Blood Sugar range is 70-100, a leading doctor specializing in diabetes treatment suggests a targeting blood sugar of 85, which is the average fasting blood sugar level for non-diabetics. The American Diabetes Assoc. …to put it bluntly, they really tick me off for many reasons. For one, I’ve already mentioned their food pyramid. It lists grains, breads, rice, cereal, pasta ….as the BASE!!! !...recommending 6-11 servings…TRUST ME…other than sugar…these are the LAST THINGS YOU SHOULD EAT!!! Secondly, I had to dig and dig to find what they say the normal range is….further more… I could not find an average fasting blood sugar level for non-diabetics… DON”T YOU THINK THAT WOULD BE A NICE GOAL!!!! DON”T YOU THINK THAT IS PERTINENT INFORMATION AND SHOULD BE READILY AVAILABLE!!! Back to the story, so now I find that I need to lower my target. The only way to do that is to lower carbs… I searched and researched looking for the perfect diet for me… I kept coming back to the Primal Blueprint by Mark Sisson. He’s the owner of the website where I found “Tabata Sprints” information originally and much much more. Going "Primal" is sooo much more than a diet, it truly is a lifestyle change in every sense of the word. To be honest, I had been transitioning and dabbling in going “primal” since sometime in June/July but I did not commit fully to it until Aug 1st. Why? Because...much of the Primal Blueprint makes sense to everyone, things like "eat more veggies" and "avoid processed foods" etc. However, not all of the tenets of Primal living are as obvious or mainstream....but when I learned what my blood sugar level should be....I felt like I had to give Primal living a shot. So why did I not share that information with everyone? Honestly, until I received my lab work reports back...I did not feel comfortable sharing the information fully. I’ve been told that there is NO Evidence of Obesity nor Diabetes in my Lab Work! Results from my visit/blood work. *** Summary: I attribute my “good report” just 7 months from being an obese, sedentary garbage disposal .....to the pillars of fitness. 1) Exercise: I perform what I consider a rigorous daily exercise 45-60 minutes a day, six days a week. 2) Meal Plan: Primal Blueprint – which is essentially a low carb/low processed food diet, eating meats, fish, nuts and vegetables. FITNESS is supported by two pillars…. Test Question: What do YOU have to do to get fit?? Test Answer: Eat nutritiously and Exercise! I am trying to illustrate a point…get this straight…THERE ARE NO SHORT CUTS TO GETTING FIT! There is no “magic” elixir, no single shake, no magic pill that will make you fit. It will take a conscious effort to eat right and to exercise…no way around it. 1) Exercise - You must exercise to burn calories, to maintain muscle tone and to accelerate the heart rate…every one needs to do it, regardless of your age, regardless of your weight, regardless of your fitness level…. ….EVERYONE SHOULD DO IT! Studies have shown that even elderly people have benefited from weight resistance….sooooo NO EXCUSES! Did you hear that? Hellooooooo. You know, I know...we all know that we need to exercise…so just do it!!! IF YOU NEED HELP PLEASE CONTACT ME….I am here to help. 2) Next but by NO means second…is MEAL PLAN. Actually, meal plan is THE most important. As several very knowledgeable people have told me…you CAN NOT exercise to fitness alone….FITNESS STARTS IN THE KITCHEN! I do not like to use the word diet, it has a temporary connotation to it…and it makes me think of a fad or gimmick….you need a long term meal plan change. You need to find a meal plan that you can live with (pun intended! ), I am NOT saying this is the only way to eat but it is certainly a meal plan that EVERYONE can benefit from….Low Glycemic Diet (low carb). When I first was diagnosed with Type 2 Diabetes, my doctor recommended and I read a book on the Low Glycemic Index titled, “The New Glucose Revolution”, sub-titled, “Shoppers Guide to GI Values 2009”. The author is Dr. Jennie Brand-Miller. Her group has a FREE website where you can learn much …FOR FREE!!! The book and website I believe saved my life and that may be an exaggeration but THERE IS NO DOUBT it saved me from much pain and anguish because once I started on the diet…my blood sugar levels began to decrease and I began to wean myself from insulin shots. The Low Glycemic Index and an exercise plan (very slow in the beginning….very slow) combined to eliminate my need for insulin, blood pressure medications, cholesterol medications etc etc. So, if everyone went on the Low Glycemic Diet, I sincerely believe it would change their lives for the better. Carbohydrates convert to sugar in the bloodstream…sugar is a poison, that is why the body has developed a means to deal with it….insulin. If your body does not produce enough insulin or your body is insulin resistant…you suffer from diabetes. The book is less than $8.00 and it will change your life….if you let it. It was then that I was accused of being…”preachy”. The lady all but called me a “stick in the mud”!!! You know, it wasn’t too long ago that I had been accused of being a “health preacher”….so now I am starting to get a complex…..am I becoming too “preachy”. Have I become too one dimensional in my thoughts and practices…maybe. So to change gears somewhat I’d like to talk about rewards…or rewarding yourself for eating nutritiously. I am a firm believer in rewarding yourself when goals have been reached. Pick a goal, work towards it and once achieved…reward yourself. I LOVE ALL FOODS…that was part of the reason I was in such bad physical shape to begin with…you can’t pick a food that I don’t like. Go ahead...try it...can't can you? Anyway, I’m getting off topic…again. What foods you reward yourself with is up to you, pick something you like. The reward food I want to talk about today is hot dogs…the good ole “all American” Hot Dog. I am NOT going to do a “buzz kill” and talk about the negatives…I am going to talk about the positives....their taste! I was watching a special on the Food Channel (I usually try to stay away from it) and it showed different locations throughout the US. Each city had it's "brand" or predominant style of hot dog. It is surprising to see all the different ways a hot dog can be “made’. They all had one thing in common…well actually two. One, they all contained hot dogs and two they ALL looked tasty!!! I once worked for an airline and my position required me to travel all over the US. I would primarily stay in or near the airport for the majority of my visits…but I was able to sample hot dogs from all over the US. I honestly loved them all, but…. THE VERY BEST HOT DOG I EVER TASTED CAME FROM …. Pulliams BBQ & Hotdogs, Mark Flynt is the owner. On good days, Mark is a great guy...on bad days....well, he's not a great guy. LOL! Just kidding! He's a cool dude 7 days a week. The address is 4400 Old Walkertown Road, W-S, NC. I am being completely honest, it is THE BEST DOG on the planet. The buns are toasted on the grill, fresh onions, slaw and chili. "All the way" is THE only true way to eat a hot dog.... Their BBQ sandwiches are very good as well …they have this hot sauce…folks it is hot but with an unbelievable flavor. The hot dog in the picture above is a "Pulliams Hot Dog". Adding to the food is the atmosphere of the place….well you can check out the pictures here, in addition Mark has a Facebook page dedicated to the restaurant. They have these tree stumps outside, they double as chairs and tables...you can use them while sitting under these huge old trees...the experience is AWESOME! Do yourself a favor, go to Pulliams…you won’t regret it. Buddy's a Dumpster Diver & Water Dam!? Doesn’t he look like such a sweet, polite and well mannered buddy? ….I can’t use the word d-o-g…he doesn’t like it. He’s not too fond of c-a-n-i-n-e either…so we use another, equally accurate word…b-u-d-d-y. Let me back up briefly, we have a garden. In the garden we throw out our organic kitchen waste. The night before, someone had thrown some leftover rolls in the garden so when I took Max out for our group workouts, (Max does the Yoga Relaxation Routine, I do P90X)…he smelled the rolls and proceeded to go and pick them up, take them to a comfortable spot in the shade and eat them. This is something I have scolded him about many times…but he can’t help himself. I had just finished my set of push ups when I turned around and saw him sitting just like he is in the picture EXCEPT he had this hoagie sized bun hanging from his mouth. I busted out laughing and by the time I returned with a camera…he looked like he does in the picture….I didn’t get back in time. My Overall goal is to increase strength, lose body fat and gain 5 pounds. To achieve this goal I will do another round of P90X, concentrating on using more weight with less reps.
Summary: The reason I set a “weight goal range”?…I am in unknown, uncharted waters. I probably have 5-10 lbs of body fat I’d like to lose but I want to increase my strength as well….so I am guessing here on what that translates to in weight gain/loss. FYI – my junior year in high school, I played basketball and I weighed 155-160 lbs….I was lean and mean….but I am not going back that low…. 2) Push Ups – Did 41 last week…..let’s make the push up goal… 54. That seems like a lot to me…but it’s only an additional push up gain per week. Again…I am in uncharted waters. But…back to the goal. WHY IN THE HECK DID I PICK A GOAL LIKE THAT!!!! NOW I AM STUCK WITH IT!!! I think I told you why….in 10th grade we had to run a 7 minute mile to play basketball…and that was one of the few goals I could actually think of when it came time to “declare your goals” for P90X. Also, I was jogging at the high school earlier this spring. This guy comes out running laps almost twice as fast as I was….and he appeared to be 5 – 10 years younger. I asked him after he was done what his pace was….he said 6:45…. So I know it can be done. Same Old Song and Dance ....my friend! This lady in China…bless her heart she so looks forward to my post…she’s afraid I’m going to stop…. I've included a video link to Aerosmith's song "Same Old Song And Dance"....why? Because I want to do so. ...oh ...and the title ties in with want I want to talk about today. 1) Old Bad Habits CAN BE BROKEN! CREATE GOOD, POSITIVE, NEW HABITS....TODAY! 2) My old habits of daily consuming empty, high carb foods has been broken. STOP! the same old song and dance......Create new, positive habits today and improve your health and fitness....TODAY! Just a couple of days ago…I was bragging in a post that I have “managed my weight loss” … blah, blah, blah. I was actually going to talk about weight maintenance in this blog post….and then I weighed this morning…..lost another pound. …”adding muscle creates a fat burning furnace” talk. Honestly…I have eaten BIG this week, stuffing myself on both Monday and Tuesday. I have eaten “clean” except for Monday night…I stuffed on pizza. As you probably know, I am diabetic type 2 and I am not taking insulin or meds…so you may be wondering what the heck am I doing eating pizza or more specifically the high carb crust???? 1) I have been eating very clean for the last 6 months, which means low carbs. 2) I have been eating SUPER clean the last 90 days, which means very low carbs. 3) My P90X workout was over so I wanted to reward myself. 4) I’ve learned a few tricks along the way to mitigate the full affects of carbs entering the system. a. Consume Fiber before the meal (or during). This will help slow the assimilation of the carbs in to your system. b. Add protein to the meal, I added a can of tuna to my pizza. Why? Same as (a.) but it also “dilutes” the carb load (glycemic load) of the meal. *** The most important thing….the next day I was back on my “clean” eating habits….except that as previously noted, I have been eating more this week. This is a pic of my Friday lunch...it is talapia and collard greens....hmmmm good! I cooked the talapia/greens in a pan with water, Texas Pete and Tony Chechere's spices. I also had a handful of pecans and an apple. Today is Friday and I have worked out all but one day….but I only worked out 20-30 minutes each day (versus an hour plus). I also jogged/sprinted three days this week… but that’s less than 30 minutes a day. I have been utilizing the Fartlek method of jogging /sprinting, jogging/sprinting. I run at an estimated 80% heart rate level for 30 secs and then jog for 60 secs. SO to summarize this section….I have been eating more, working out but not as much and yet I still lost a pound from last week. This is my first post since Friday, …been busy at home. Sunday : Technically Sunday was a rest day and was the last day of my 13th week of my first round of P90X. I did rest but I also did some back exercises and threw in some ab exercises as well. Nothing too heavy but I was active. Monday : (yesterday) started my rest week. I’m told that everyone should rest for a week or two before starting another round of P90X. So, I do plan on doing just that…resting but working out some too. On Monday, I did about 70 decline push ups, 60 chair dips and some sprints. The sprints including warm up and cool down lasted less than 30 minutes and the additional exercises I performed throughout the day…so although it may sound like a lot of work….it really wasn’t. I have to tell you….just completing P90X is a huge accomplishment for me. I know when I write this, it will not sound that meaningful…but to know where I was in Feb. ’09 and see where I am today….I certainly would not have believed it. And…I don’t think anyone who knew me would have guessed that this was possible either. Tuesday : I did rest today…did not sleep well and was dragging all day…but I did finish this post! 2) BMI = Normal, Current Weight = 168 lbs…..Done! 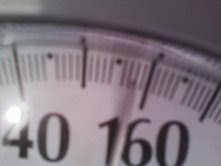 I have done a good job of maintaining my weight in the upper 160’s. 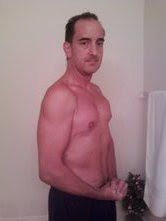 I have not lost any additional weight since August 10th., when I weighed 166 lbs. 3) 30 Push Ups….DONE! I actually completed 41 on Sunday!!! Just a note, that is an increase of only 1 push up from the previous week, prior to this week, I had seen increases of 2-3 push ups each week. 4) “Beating sons in basketball”…Done! 5) Sub 7 Minute Mile - I did not reach this goal… but that will be goal #1 in my next round of P90X. 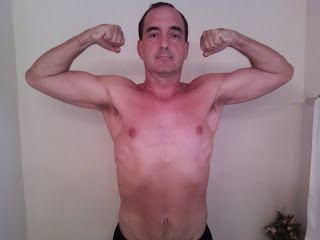 NEXT ROUND OF P90X – I am taking a week off and starting another round 8/31/09. Chin Ups on a WWI Statue---WHY? - Your First Car – I sold my ’72 Camaro for $800 on a trade in for a Toyota Tercel.….and yes I will never, EVER forgive myself! - First Wild Mushroom Trip - ok, I’ve never tried wild mushrooms but Tony Soprano made we want to try it after watching that episode of the Sopranos…. - Your First P90X ROUND!!!! Another Tony.....Tony Horton and Perry Kyle talked me into this one. I am glad they did. I watched the infomercials for a long time and wondered what it would be like, could I do it? Did I have the drive and determination to complete it? As I type this on Friday, I only have the YOGA X workout left to do on Saturday. So it "ain’t" over …but it is almost over. I kind of feel like I do when I go to the beach on vacation…the last night you DREAD the next day because you know it’s over and you have to go home. Final pictures, measurements and goal update will be Sunday night or Monday morning, depending on my schedule for the weekend. Major props go out to Alicia and Christopher Haas – they have lost 27 and 18 lbs respectively. They are on their way to "getting fit"!!!!! If you know them…encourage them to keep it up! 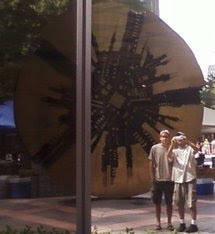 My Son (Brad) and I went to Charlotte the other day…. Here are some pictures. I’ll be honest with you….I am not one to go to downtown areas of cities unless I have a specific reason to do so...and I did this day. While we were there we walked around the downtown area. Even on a hot August day it was still enjoyable. 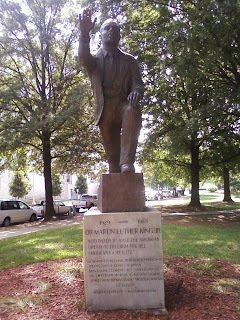 The picture on the left is a WWI memorial and the picture on the right is of Martin Luther King. 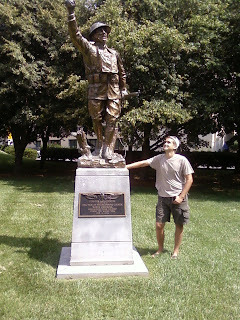 Why would someone try to do a "chin up" on a brass WWI statue????? Day 88!!!!! Two days left! Today I completed a Kenpo X, P90X workout. That leaves me with only Core Synergistic’s workout tomorrow and a Yoga X on Saturday….in case you do not recall this is my last and final WEEK! My 3 month commitment is nearing it’s end. Completing P90X is not the end…only the beginning. I haven’t decided my next move for sure but I will likely take a week or two off and begin another round of P90X. In this next round, I am going to concentrate on performing less reps (with more weight) to increase my strength. I continue to eat a fairly high volume of food...but as usual, I eat very "clean". I eat very little carbohydrates unless they come from vegetables or fruits....NO PROCESS FOODS, no flour, no bread, no "cereals" etc. It isn't always easy to stay on target. The other day I made spaghetti for the family unit with lean ground turkey. I ended up eating the spaghetti sauce over veggies instead of the pasta. I had intended to make the "squash" noodles but I forgot until it was too late. Late Dinner: Grilled Whole Talapia, Broccoli and Cauliflower. Now...the Talapia may not look very appetizing...but it is/was delicious! I wipe them down with Texas Pete and a melted butter. Next I shake on Tony Chechere's Cajun spice and place them on the grill. I put the butter and the spices in and on the fish. I haven't posted to my blog in several days...just didn't have time. BUT rest assured that I completed all of my P90X workouts and this week actually ran some sprints as well on Monday and Wednesday. I HAVE NOT BEEN RUNNING TABATA SPRINTS - I did run those for a couple of weeks but they were just too tough for this old man. :) The sprints that I have been running? 30 sec sprints, 60 sec rest. Where was I...oh yeah, I look in the mirror and I am somewhat satisfied with my progress but I still have a lot of work to do to improve my fitness. It is surprising because if you’d asked me in Feb ’09 what my fitness level would be in Aug ‘09…I would not have guessed I’d be where I am today, that is FOR SURE! What would I like to Improve? First, I’d like to decrease my body fat percentage and second, I like to increase my muscularity. Seriously though, to have been an obese sedentary garbage disposal to a somewhat fit person in 6 months…I am ELATED!!!! I know what you’re thinking, (I am clairvoyant), Steve why do you call yourself an obese sedentary garbage disposal? Isn’t that redundant? After all….garbage disposals by their very nature are sedentary…they are mounted to the cabinets and plus you have all the plumbing. Goal Updates – Down Hill Track – Both ways???? I’ll do a full update in tomorrow’s post, I’ve got to run a test mile. But just to give you a mini-update, all my goals are good except one, the sub 7 minute mile. I did do 40 push ups yesterday… woohoo! In order to run a 7 minute mile…I’ve come to the conclusion that I will need to run the mile….DOWN HILL…so I’m trying to find a track or tract that is one mile and is all down hill. Six months ago, I could have probably rolled down a steep one mile long hill in under 7 minutes….today….don’t think so. So...I'm thinking about going to Mt. Mitchell for the final test next weekend....there...I think I've got a chance. :) What??? No one said "where" I had to run a mile and no one stated the "grade" of the track? LOL! That is all for today….eat clean and take a HIKE! P90X Day 83 & Week 12 Are History!!! Only 1 “Recovery Week” Remains…. My "Fitness Quest" will, of course, not end with P90X. I will likely take a week or two off and then begin another session, but as I said, the BLOG WILL CONTINUE! The weeks have been going by quicker and quicker now that I am near the end. I am guessing it’s because my body is adjusting to the physical activity. Don’t get me wrong…it is still difficult; as you become stronger you should perform more reps or add more weights to your workouts…and I do. One of the big selling points with P90X is that the workouts change and work different parts of the body daily. Beachbody calls this “muscle confusion”. The main purpose of “muscle confusion” is to prevent the “plateau effect” which can occur if you perform the same or similar exercises over a period of time. …it’s simple, but it’s not easy. When I say “Push Play” I am talking about playing the P90X workout DVDs but your workout could be ANY exercise or physical activity that stimulates the muscles, your lungs and heart. How much you need to stimulate your lungs and heart depends on your current fitness condition. Eats – My Meal Plan Yesterday - Still Eating MUCH but it’s all “clean”. Dinner – Salmon Patties & Salad – I have a very healthy recipe. Who Came to Visit?? ?…the countdown begins! 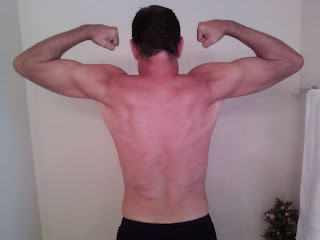 Today is Day 81 with P90X, only 9 days left ...the countdown begins. end. I don't think there is any doubt that I am in the best total shape, in my life. playing basketball with guys half my age. doing more push ups than I thought was possible. This is NOT about bigger muscles or any of that "phoney baloney" stuff, it's about fitness. There are MANY who are stronger, faster, etc than I am but you know what...I don't care. To me, it's not where you are it's where you came from. Six months ago, I was a fat, sedentary garbage disposal...today I am not. That is what matters the most...that I improve my fitness everyday through diet and / or exercise. It’s bad enough that my family and friends stop by the house daily wanting me to “pull up my shirt” for a preview but now local media is calling and parking outside in front of the house. Look, it's not that I don't mind showing people my progress because I want to do whatever I can to motivate others...but it is getting a little old. Not only does it require more and more of my time but ....it does seem to be degrading. I guess it's true....we all have our burdens to bear or is it bare. As I am trying to finish this post for the last time, I hear some voices and then the door bell rings….AGAIN! I am getting irritated with these people who just drive up and expect to talk with you. I pull back the blinds to get a sneak peak outside and YOU WOULD NOT BELIEVE WHO IS AT MY FRONT DOOR!! ....it’s Bill O’Reilly and Courtney Friel from FOX! WOW! I run to the bathroom to check my appearance when I hear Tammy calling me. I yell back at her, "I KNOW, I KNOW I'll get the door!". at the same time she’s pushing me onto the railroad tracks!!! What the…. “steve, steve, Steve, STEVE!”, Tammy yells ever louder. “what do you want, Bill O’Reilly’s here to see me.” I reply as I comb my blond, shoulder length hair with my fingers. “Well what about Courtney? Is she here?” I ask, as I come out of a deep sleep. “NO!, no one is here but me and the boys, NOW GET UP!” She replies with the softness of a blacksmith’s anvil crashing onto my head…and dreams. I’ve been eating a lot of eggs and collards for breakfast lately so I decided to give myself a break from those items. Today, I had a hand full of pecans and then ate some canned Bumble Bee Mackerel…I have learned to LOVE that stuff. It’s tasty, it’s inexpensive and it is packed with good fats and much protein. Along with that I made some slaw with Virgin Olive Oil (no mayo) and I warmed up some leftover green beans. These are home grown and canned green beans from my dad. I added a piece of bacon and cooked these last night….hmmm good! P90X WOD (Workout Of the Day) = YOGA X, sprints later if I feel like it. Lose Weight and "Get Fit"? Learn How to Control BG?